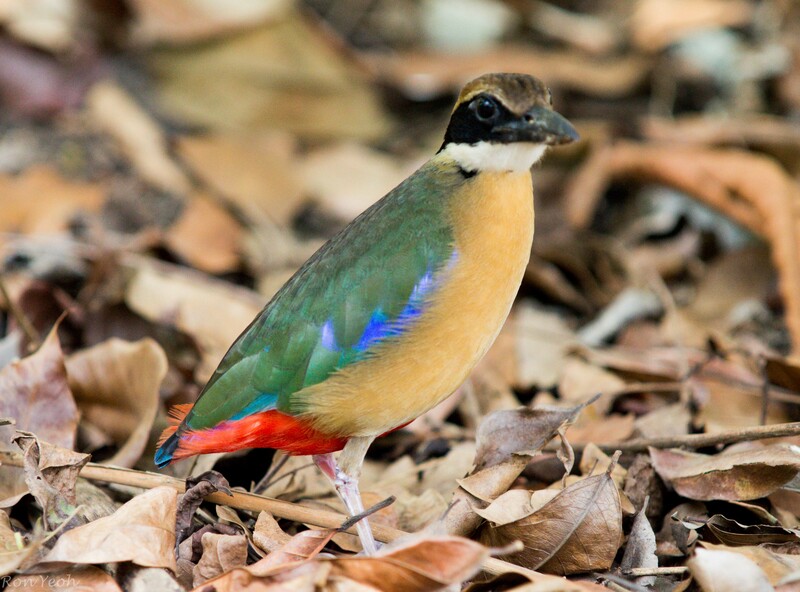 Having been an enthusiastic birder for many years, I’d never ever seen a pitta before…had read about them…seen pictures of them but just never been able to find them. 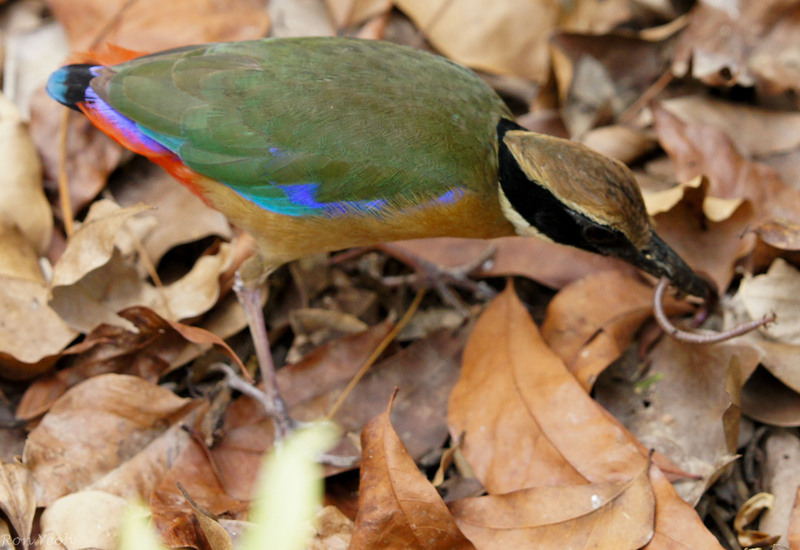 I even went to Borneo to seek the elusive pitta…I saw many other wonderful birds but no pitta. Little did I know that in the winter, these birds which hail from south China migrate down the Malay peninsula down to singapore, indonesia and even as far as Australia according to “Birds of Peninsular Malaysia & Singapore” by Jeyarajasingam and Pearson. 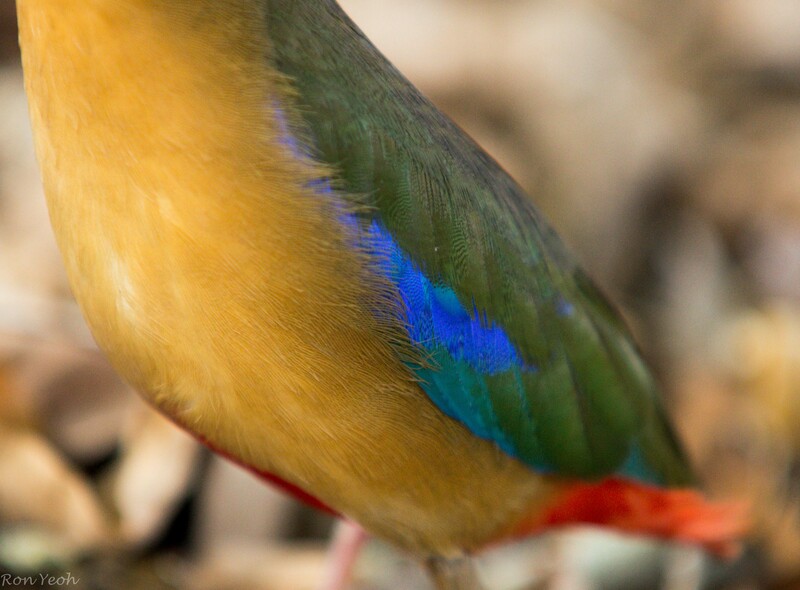 And I finally realised that one had to have contacts who knew when these wonderful birds were about and that was the only way to find them..you can’t just go birding in any area and hope to find a pitta. 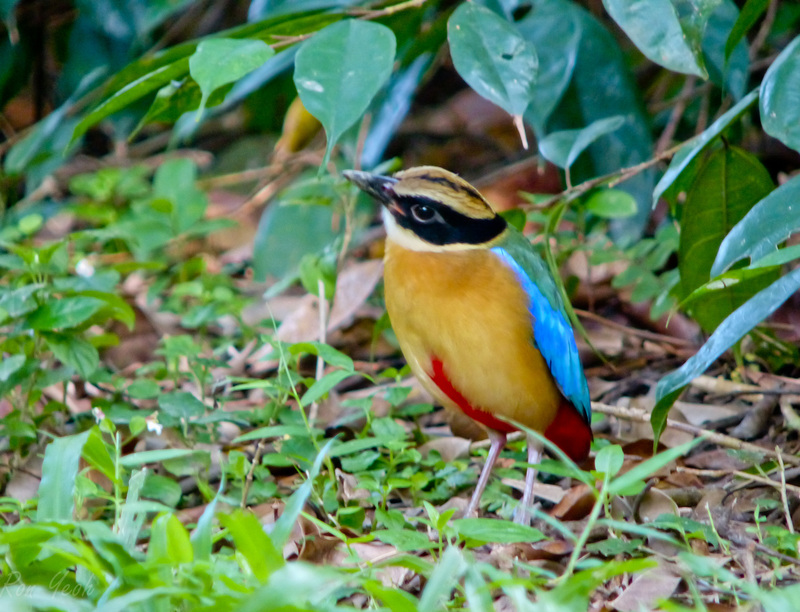 I was at lunch with a friend in October 2013 when he mentioned that the blue winged (BW) pitta had appeared at the soon to be redeveloped Bidadari cemetery, a known birding site popular with migratory birds. I had my camera with me so I headed straight to Bidadari where I soon saw about half a dozen birders with their huge cameras/telephoto lenses, camped around a little clearing. 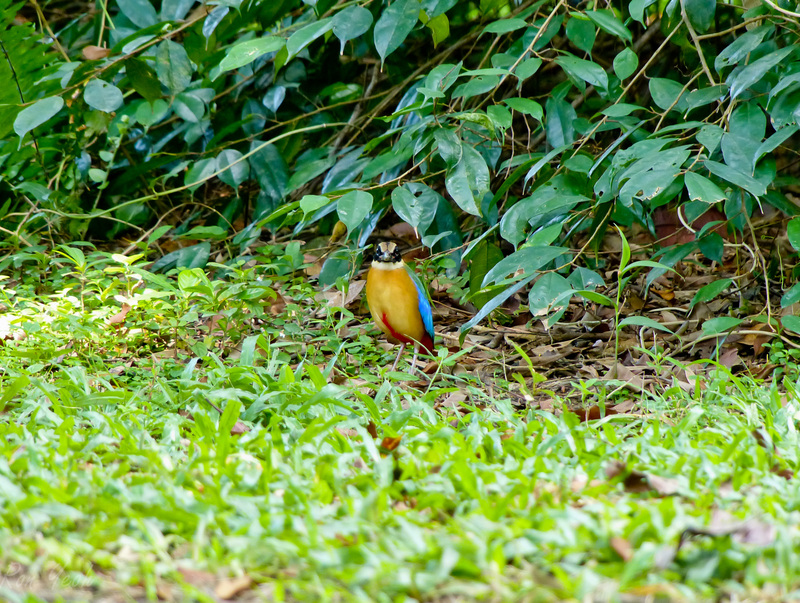 Joining them, I couldn’t see anything at first, but eventually everyone started clicking and there it was ..my first ever view of a blue winged pitta in the wild…it was very skittish and would hop out from under a bush to peck at the ground looking for food…facing CLICK CLICK CLICK CLICK CLICK… and then hop back under the bush when it felt nervous. 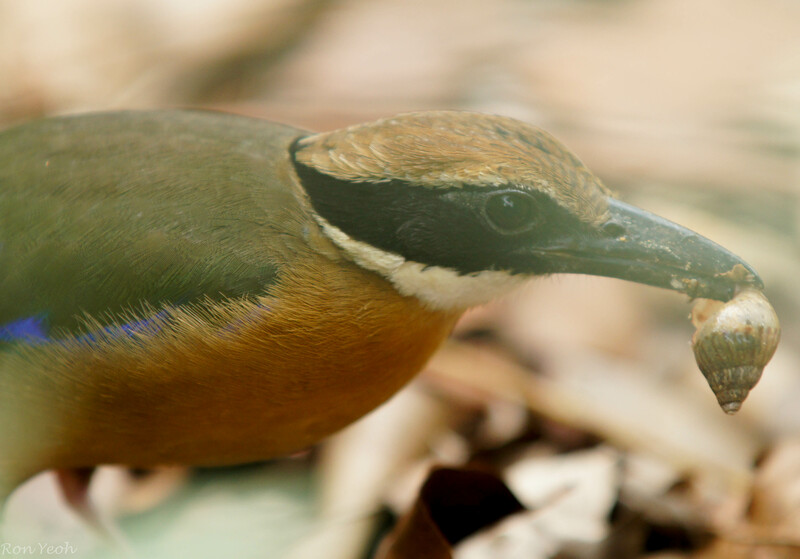 The BW pitta is very very similar in appearance to the Mangrove pitta but the BW pitta is distinguished by the presence of a pale buff lateral coronal stripe …that’s the stripe you see just above the black eye patch in the picture below…the mangrove pitta lacks this buff stripe. 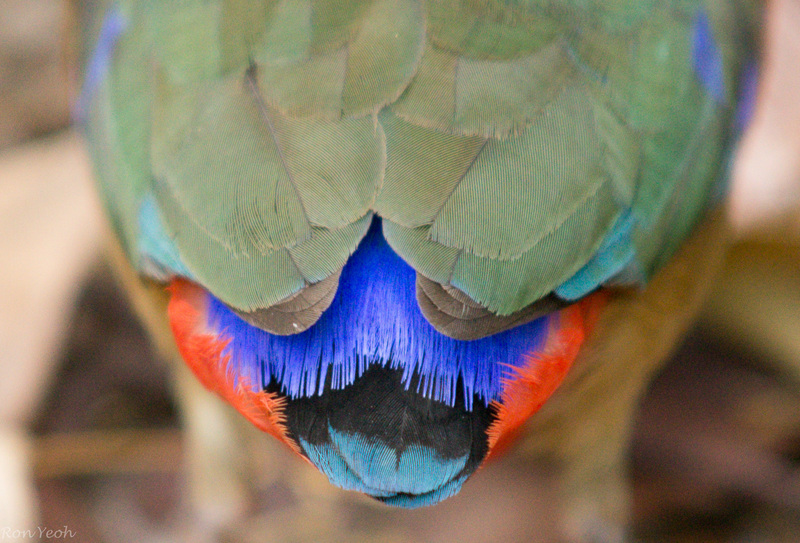 I found that the colours of the BW pitta were more brilliant also…. 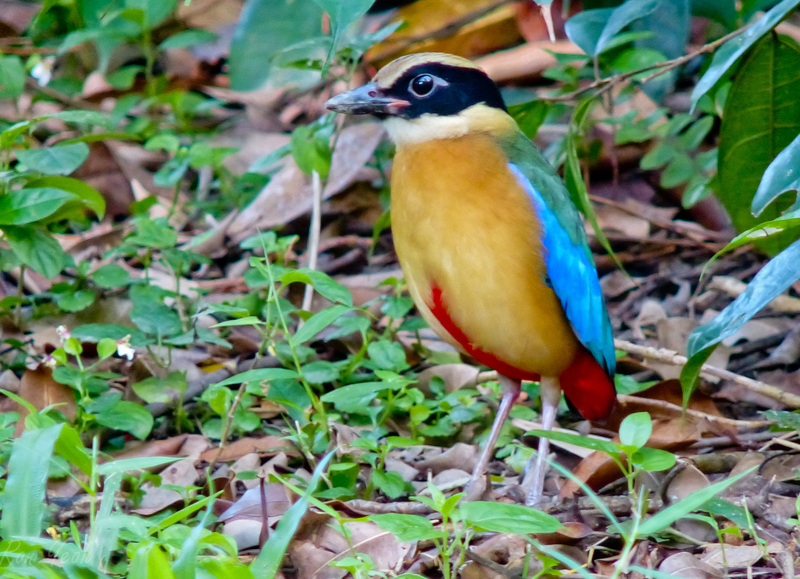 This BW pitta stayed in Bidadari for just a couple of weeks and departed….and I thought I wouldn’t see another…..until a couple of days ago when my macro photography teacher told me that there was a mangrove pitta in the Botanic Gardens…which could hardly be more central in Singapore! Finishing work early, we easily found the place by looking out for photographers and sure enough we found it soon enough…in contrast to the BW pitta, the Mangrove pitta in this case was not at all shy nor skittish..it was very calm and strutted about right in front of us and only retreated when we got nearer than 3 feet from it! It felt like if I’d had a worm in my hand, it would have fed off my hand. 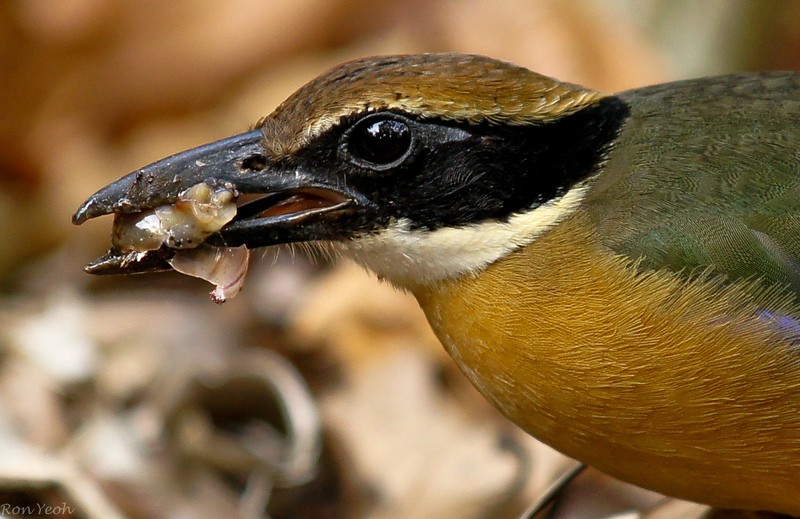 It was obviously hungry and continuously foraging for food…. cracked the shell and accessed the escargot.. 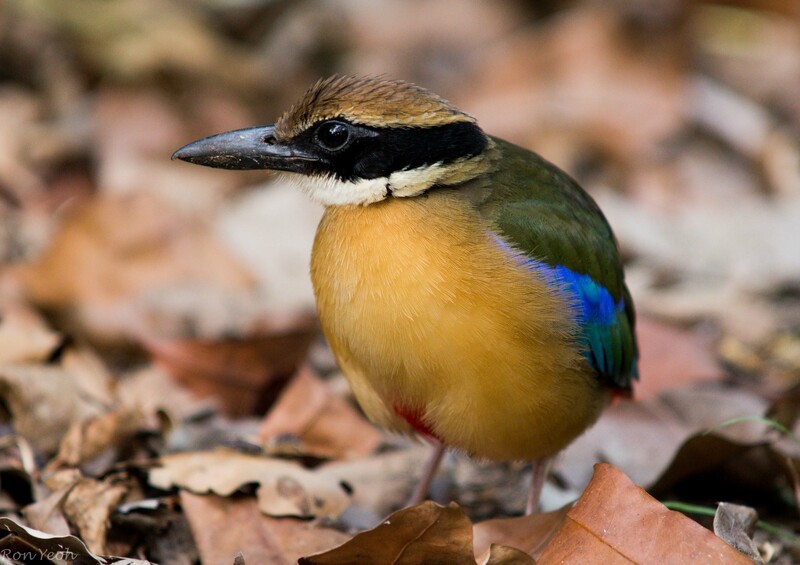 It was remarkably friendly and allowed us up close to take these photos…..
We can see quite clearly that the Mangrove pitta does not have the buff lateral coronal stripe above the black eye patch that the BW pitta has. 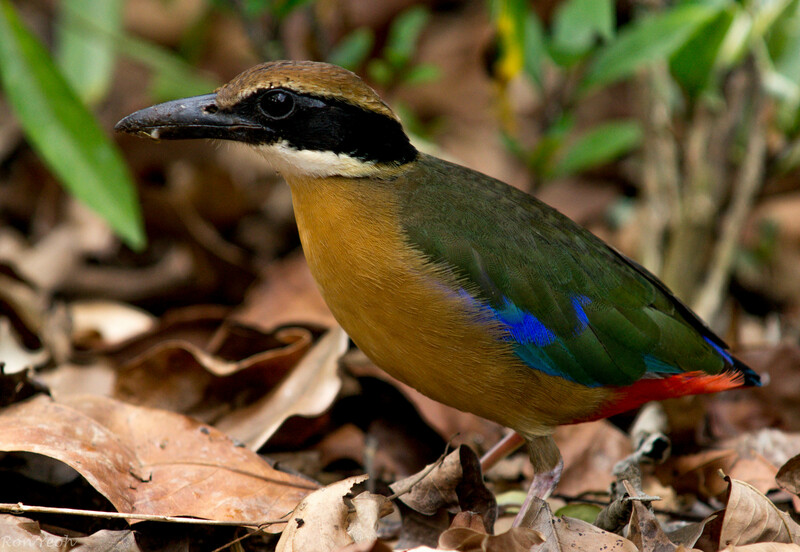 The Mangrove pitta strikes me as being just a little duller in colour (but still v pretty nevertheless) , has a little less blue, has a slightly larger beak but is a lot more approachable and less skittish than the BW pitta. 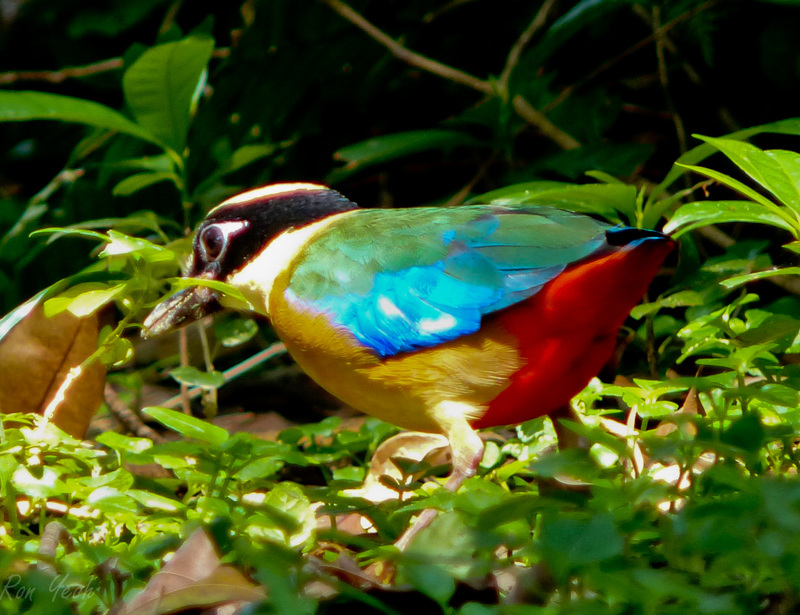 So..in the end I did not need to leave my own shores to see this remarkable bird….I only needed to pick the right time and place…all in Singapore!